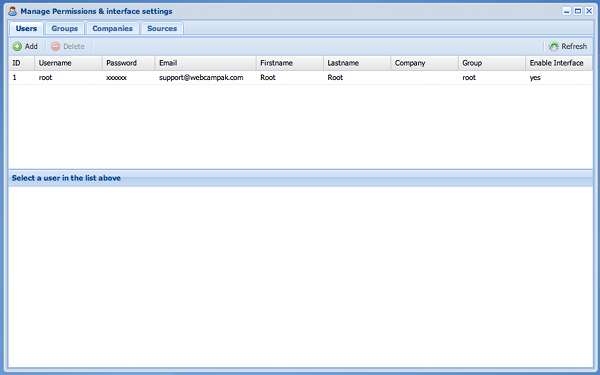 This window let you configure users, sources and all related permissions. Users: to add/edit/delete users and manage access to sources. Groups: to add/edit/delete groups, manage group members and group permissions. Companies: to add/edit/delete companies. This configuration is only for administrative purposes and does not have any impact on Webcampak. Sources: to add/edit/delete sources and manage members. When you first configure a Webcampak, first start by creating a company and a group before starting to configure users as you will have to select a group and a company when a new user is being created.